Nate Wooley grew up in a finnish-american fishing village in Oregon. He has spent the rest of his life trying musically to find a way back to the peace and quiet of that time by whole-heartedly embracing the leap between complete absorption in sound and relative absence of the same. He began playing trumpet professionally at age 13 with his father. Nate's music deals more with a cobweb of sound then with pure melody and meter. He is sought out for his work in the free jazz idiom, but finds more meaning in a well prepared sound or silence or burst of feedback. 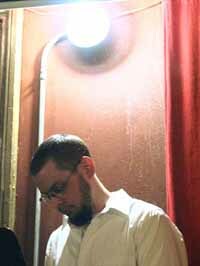 He currently resides in Jersey City, New Jersey and has performed or recorded with Anthony Braxton, John Butcher, Alessandro Bosetti, Chris Forsyth, Fred Lonberg-Holm, Tony Buck, Joe Morris, Jack Wright, Fritz Welch, Jason Roebke, Scott Rosenberg, Herb Robertson, Randy Peterson, and Tim Barnes.